Whenever I make pulled pork someone usually asks for a recipe for the barbecue sauce. I am always happy to share recipes but I can’t for this – I never use a recipe when making barbecue sauce and I never do the same thing twice, I just throw things together and keep adding stuff until it tastes good. 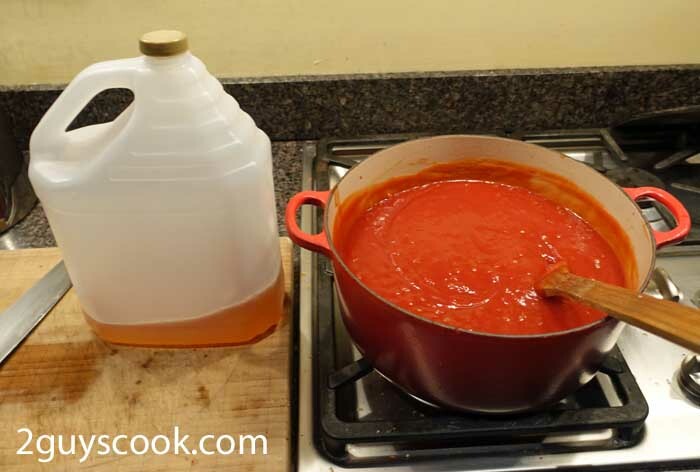 This entry documents my latest attempt at making a tomato based sauce. Barbecue sauces typically use tomato, mustard or vinegar flavour bases. Not wanting to choose a favourite, this sauce is predominantly tomato but the flavour is bolstered with a healthy dose of vinegar, mustard and tons of spices. A traditional recipe format is included at the end of this posting. 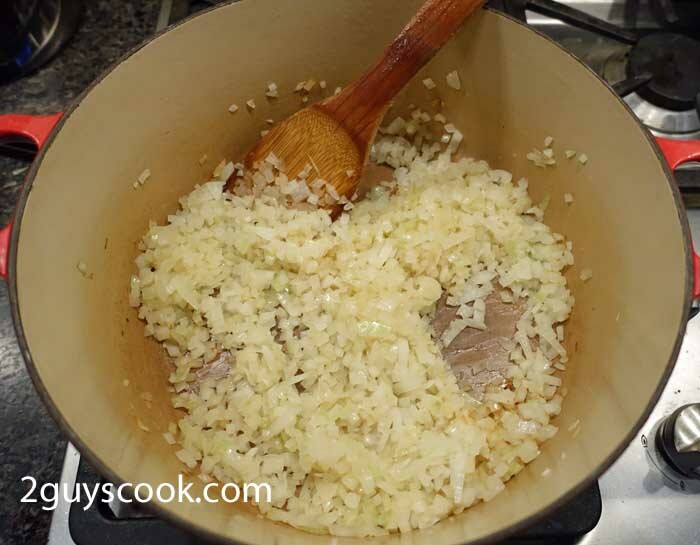 Onion is finely chopped (should be chopped a little more than pictured) and carmelized (much more than shown). Ketchup is added followed by liquids and spices. Tamarind concentrate, worcestershire sauce, tomato sauce, soy sauce, liquid smoke, mustard and apple cider vinegar are added. The tamarind provides a very tangy, fruity edge to the sauce. I threw in left over dry rub from the pulled pork and harissa powder from a Moroccan meal a few months ago. In addition, garlic powder, onion powder, asafoetida, smoked paprika, paprika, pepper, cumin, coriander, cayenne and Kashmiri chili powder were added. The sauce initially tasted “too ketchup-y” so I added a large can of tomato paste. The flavour was still a little flat until bourbon was added. It somehow melded everything together and really provided the finishing touch to the sauce. Please note: Please note the amounts listed above are completely approximate. Increase, decrease, add or remove spices and flavourings according to your taste. The large quantity of sauce outlined in this recipe was for a pulled pork using the entire (15+ pound) pork shoulder with additional left over to put on sandwiches. Saute onion in a little oil in a tall, large pot. (Deep pots will help with splashing when the sauce boils. Thick sauces can get very hot and can cause quite a burn if you get splashed). Cook until golden and well carmelized. Add remaining ingredients, except bourbon, and mix well. Taste and adjust seasoning. Heat until boiling and simmer for 30 – 60 minutes to meld the flavours and increase thickness if necessary. Add bourbon, make any further seasoning changes and cook for another 20 minutes. I usually add molasses to barbecue sauce but this batch tasted quite sweet already. If making pulled pork add any leftover dry rub to the barbecue sauce.